As a new dog owner, Judy Antell, TravelingMom with Pets, found that dog friendly often meant kid friendly. The chill Austin vibe suits both families with kids and those traveling with dogs. And the awesome food trucks welcome all. To “fit in” in Austin, Texas, you need tattoos, a lot of piercings and facial hair (male only). 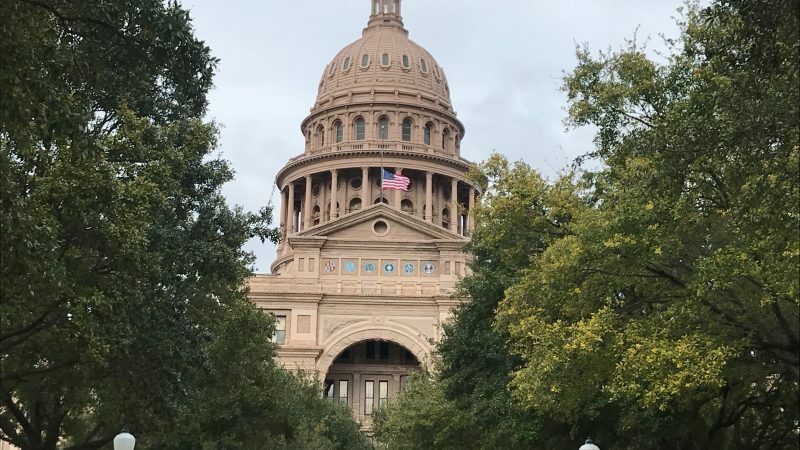 We were able to ‘pass’ in Austin on a recent family trip. My youngest daughter has her nose pierced, my oldest has her cartilage pierced and my husband has a beard. When a friend with a yellow Labrador joined us, we could almost pass for locals. We found plenty of places we could bring the dog and have great food, along with a local craft beer. Yes, even vegans can eat happily in this meat-centric locale. For much of the year, Austin has a mild climate conducive to outdoor dining. Of course, when we visited in December, it was 40 degrees. But the weeks before and after, it was 80. When it’s nice out, you can eat in outdoor cafes. At most of these, dogs are welcome. And even in colder weather, heat lamps make outdoor dining cozy. We went to Banger’s Sausage House & Beer Garden, which had a semi enclosed outdoor patio filled with dogs and their owners. We were there for happy hour and there were lots of local beers. People were also eating sausage and BBQ. And there were some tasty sounding vegan options. Jo’s has two locations, on South Congress and downtown. This is THE place for breakfast and lunch. They have great coffee, tacos and egg dishes. Dogs are always welcome. Bouldin Creek Cafe also allows dogs. And the vegetarian and vegan food was amazing. We shared the cauliflower bites with smoked paprika aioli, a homemade veggie burger and the vegan BBQ plate. We had to have our Texas barbecue! 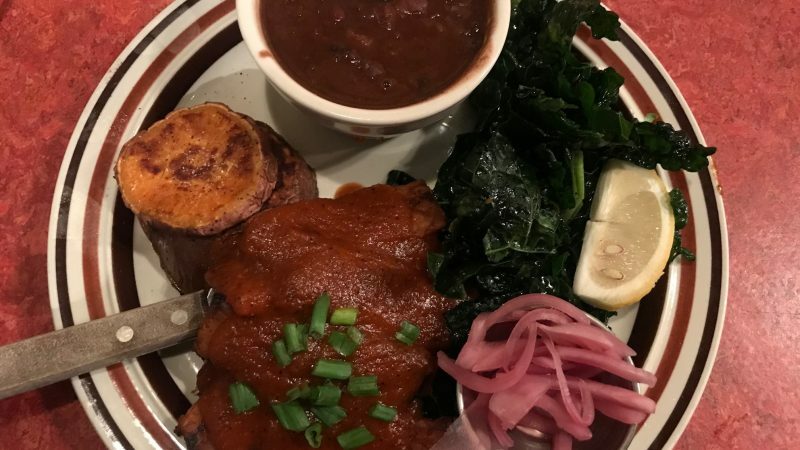 This had locally made tempeh in a delicious BBQ sauce, beans, sweet potatoes, pickled onions and kale. Bouldin Creek has a great selection of local beer on tap. But is was so unexpectedly cold, we got Bouldin Creek Fogs: tea with steamed milk or almond, soy or coconut milk. Perfect for a pick me up. And there is so much delicious food available from food trucks. You could eat every meal from a food truck. And these are so easy with dogs or kids. 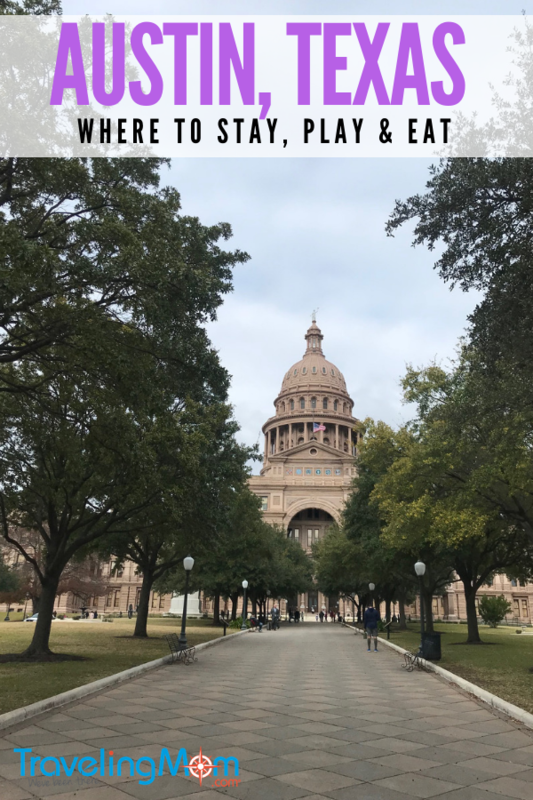 We stayed at the InterContinental Hotel – Stephen F. Austin, right in downtown. The hotel lets dogs under 60 pounds stay. There is a cleaning fee of $100, no matter how long your stay. We had a king room with a pull out couch. There was a mini fridge, large bathroom, and plush robes. Everyone was very friendly at the hotel, from the valet parking attendants to the concierge to the cleaning staff. One evening, as we were getting ready to go out, the fire alarm went off. We all gathered in the lobby, and were served champagne for the inconvenience. The hotel has a pool, hot tub, and decent gym. If you have elite status, you can get into the breakfast buffet, off the lobby, for free. The hotel also provides free coffee in the morning. And there is a jar of dog treats in the lobby. Austin has no shortage of bars. 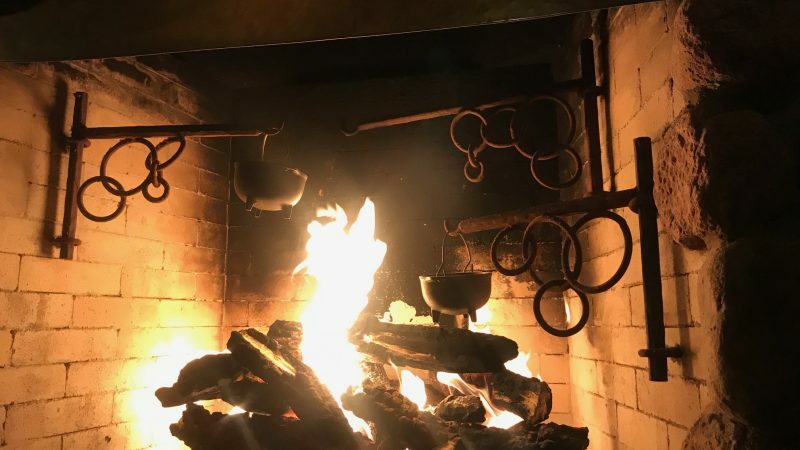 But on an obscenely cold night, (for Austin) we sat in front of the fire in the Roaring Fork, the restaurant and bar in the hotel. 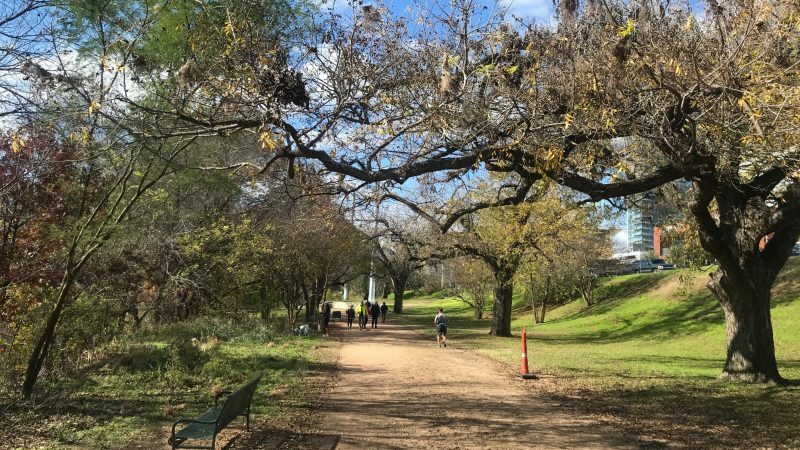 Head to Zilker Metropolitan Park. We went for an invigorating walk along the water where everyone had at least one dog in tow. Barton Springs Pool, a huge body of water fed from underground springs, is open year round for swimming. Just outside the sanctioned swimming area (where dogs are prohibited), dogs and their owners cool off in the water. The official off-leash area here is called Barky Springs. 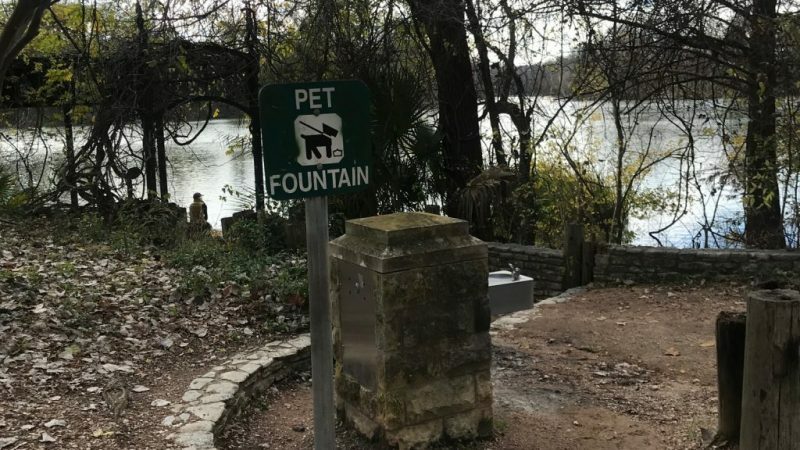 Dogs can’t come into Umlauf Sculpture Garden, an outdoor museum within the park. We took a quick stroll through where my daughter carried on the family tradition of posing like a statue. Leave your dog behind when you go to the Lady Bird Johnson Wildflower Center. This botanic garden, about 15 minutes from downtown Austin, focuses on native plants. There are over 800 species of wildflowers and 50 species of oak trees. Note: The InterContinental Hotel offered me a media rate. Opinions and fun were all my own.